We’re sorry you couldn’t join us back on December 13 for our webinar on covering strategies and tactics to collect more patient payments in 2019 and why maintaining revenue cycle status quo is simply no longer an option for medical practices. Panelists on the webinar included: Joe Clark, CEO of Sierra Orthopedics, John Hornberger, CEO of Orthopedic Center of Palm Beach County and Eric Brodsky, Principal at Epoxy and Executive Director of the Illinois MGMA. Here’s the good news! If you couldn’t view the webinar the first time around, you can now. The webinar is now available online. 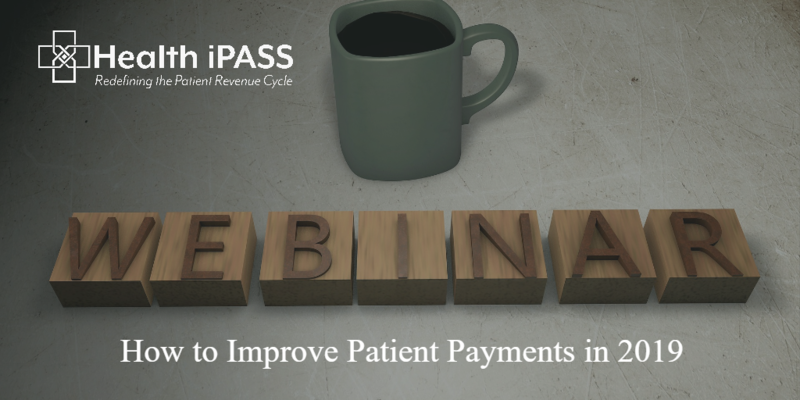 Here are some of the highlights from the entertaining and informative webinar on how to improve patient payment collection in 2019. The panel touched on a lot of topics regarding the current state of the patient revenue cycle in healthcare. They discussed current patient revenue collection strategies—specifically what is and is not working--- and the difficulties of securing patient payment guarantees. Additionally, the panel discussed the future of revenue cycle management. They talked about what is adding to the cost to collect, how the shift from fee for service to value-based care impacts future payment models, and how a medical practice can effectively address change management. The panel also mentioned how keeping up with the “status quo” of not using technology and delivering paper statements will ultimately sink medical practices, while also noting how use of technology has improved relationships with patients. While all the panelists agreed that implementing these technologies are the only way to ensure practices collect most of the patient payments they are owed, they also talked about the hurdles that come with moving toward these technologies. We have improved our website to give visitors easier access to Health iPASS content. You can find the webinar on our new “webinar” page under the resources tab. To listen to our informative webinar, visit the landing page and fill out the form on the page to get instant access to our webinars. Has this webinar on how to improve patient payment collections motivated you to take action and explore your options? Let us know and we can set up a quick demo of our patient revenue cycle solution.